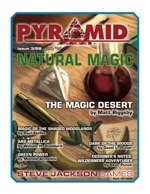 If you think natural magic is all druids and bunnies and glowing moss, you're in for quite a surprise, courtesy of Pyramid #3/68: Natural Magic. This issue's intersection of Gaia and glamour offers new GURPS Dungeon Fantasy lenses for the life-force wizard, elemental druid, and high druid from the quill of Sean Punch, as he takes you behind the scenes of his recently released GURPS Dungeon Fantasy 16: Wilderness Adventures. Other fruitful endeavors in this issue's bounty include an expansion of GURPS alchemical ideas (plus 40 effects), from GURPS Thaumatology: Chinese Elemental Powers author William H. Stoddard, a magical desert from GURPS Locations: Tower of Octavius guide Matt Riggsby, and an intriguing adventure outline from GURPS Banestorm: Abydos curator David L. Pulver. It also features a new GURPS Thaumatology: Magical Styles philosophy used by dark elves (complete with three new spells), a write-up of nature-based abilities using the GURPS Powers framework, and more. When the magical and natural worlds collide, the results are preternaturally powerful -- and that's especially true for this issue of Pyramid. Pick it up individually, or start your subscription today for months of arcane-awakening awesomeness!